When the major NYC in 2003 hit, some restaurants decided to grill outside and give away free meals rather than sit and wait for their refrigerated and frozen stock to thaw and spoil. It was a sensible strategy in a time of short-term crisis. When the financial crisis hit in 2008, regardless of the fact that it was come-uppance for insane and unsustainable banking policy, “But it’s an emergency” was used as a blanket rationale for all manner of drastic short-term stimulus. Now, 10 years on, interest rates are still close to zero, spending is exploding while tax revenues are slashed…an indefensible non-strategy a decade later. These dang trillions are flying by so fast, they’re hard to see. The US gross national debt jumped by $72.8 billion in one day, on Thursday, the Treasury Department reported Friday afternoon. This March 16 is a historic date of gloomy proportions, because on this date, the US gross national debt punched through the $21 trillion mark and reached $21.03 trillion. 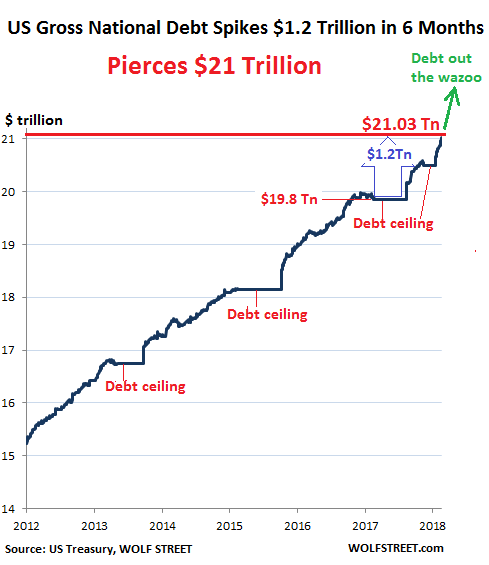 Here’s the thing: On September 7, 2017, a little over six months ago, just before Congress suspended the debt ceiling, the gross national debt stood at $19.84 trillion. In those six-plus months – 132 reporting days, to be precise – the gross national debt spiked by $1.186 trillion. I tell you, these dang trillions are flying by so fast, they’re hard to see. And we wonder: What was that? Where did it go?